Inspired somewhat, by ingeniousclown's Research Assistant, Sous Chef will make your provisioning life somewhat easier, by keeping track of things so you don't have to. There's also a toggle to show Special Ingredients (Spices and Flavourings) as S and F, or the category icons(eg Grilled) instead of their ranking. She will take note of any recipes that you don't know, in your inventory, bank, guild bank and guild store, and mark them for your later elucidation. Let it not be said that your Sous Chef doesn't look out for you! Alternate Character (Recipe/Ingredient) Knowledge will spread the information of your culinary knowledge to all your bank alts. There is some arbitrary sorting done on the Provisioning Table, rows will be sorted first by rank, then quality, then name (Note this still mixes up somewhat the first rank recipes as they span 1-20), and quality colouring is added to the row. You will also be able to filter the Provisioning Table to show only blue or better recipes. Sous Chef will also track a Shopping List if you so wish. To do so, simply mark any recipe you wish to keep track of, in the Provisioning window, and Sous Chef will highlight the ingredients for those recipes in a different colour. You can also ask her to only worry about the Shopping List and ignore all other ingredients. With regards to non English clients, there are a number of Recipe/Result combinations that do not match exactly. EG: Geißelwürzeconfit comes from a Rezept:Geißelwürzenconfit, which I assume (verb and noun appropriately) is either due to a typo, or different people translating the original. French recipes have examples like "Recette de bière à la viande sombre" to make "Bière de viande sombre". I have an experimental filter to remove 'de' and 'à la' to try and improve matching, but that doesn't work in German, where it's all a single word (Difficult to differentiate endings and the like from midword letters). I've tried to handle this, but cannot reliably do so, so I must sadly decline any future bug report of this nature. 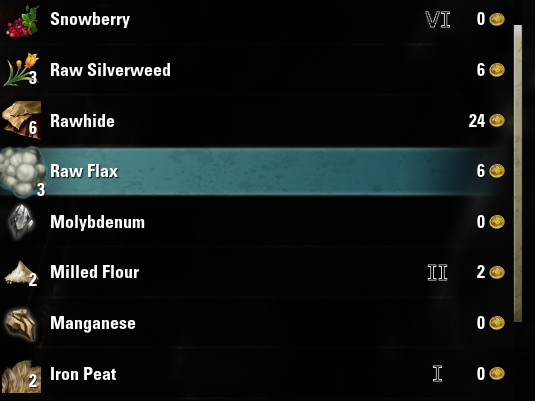 If you could report to Zenimax, the typo (I'm unsure what sort of priority they have for text adjustments), that will resolve itself in the future, but that is all I can offer as a solution to this issue. If a recipe name is in that list, it will not be considered for marking.